OK, so the title is a bit harsh, but in reality I have nothing against the color pink and probably have a few shirts myself that make me look like a bearded, overweight Barbie. Nonetheless, the color pink is rarely associated with football unless boots are the topic of discussion, but even in that realm pink has lost its place in the last year or so it seems. As far as football clubs that have embraced the color pink and made it a staple of their look and tradition are concerned, there are five that come to mind. 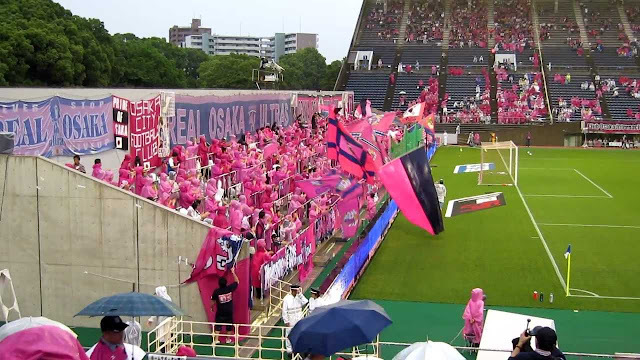 Many clubs around the world have used pink as a form of alternative look for a season or two. English side Everton for instance have used pink on a number of occasions, but haven't made the color a permanent feature, unlike the five clubs below. If you're thinking that Italian club Juventus don't always use the color pink you'd be correct. However, Juve makes this list for two reasons: for one, the club has used the color pink on their alternative shirts many times in the past, including an interesting getup for this coming season. But the real reason why I included "The Old Lady" on my list of five is because the club's first ever shirts were in fact pink (as seen in the first photo taken of the club in 1898). As a matter of fact, pink could have been Juve's official color to this day if it wasn't for a man named John Savage who had asked English club Notts County for their black and white striped shirts to replace Juventus' fading pink ones in 1903. As is the case with Juventus, Scottish side Patrick Thistle do not use pink in their primary colors or in their club's badge. But in 2008 Thistle became the very first club in Scotland to permanantly incorporate the color into their away kits on a permanent basis. Since the 2008-09 season Patrick Thistle has had various interesting designs which included pink in combination with black, silver and white. 56 year old Japanese club Cerezo Osaka is all about the pink. The color is their primary together with a bluish purple accent. Together, the color combination is very sharp, but by sharp I really mean that it feels like somebody is cutting your eyes out with a Tanaka sword. It seems that the club has decided to incorporate the brightest, most candy-like shade of pink for their shirt and crest and I feel like sitting at their home stadium could very well bring one to the state of an epileptic seizure. 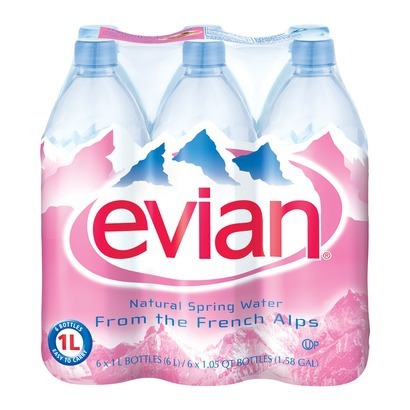 Despite having a crest that consists of red, white and gold, French club Evian are actually nicknamed Les Roses, which in French means "the pinks". 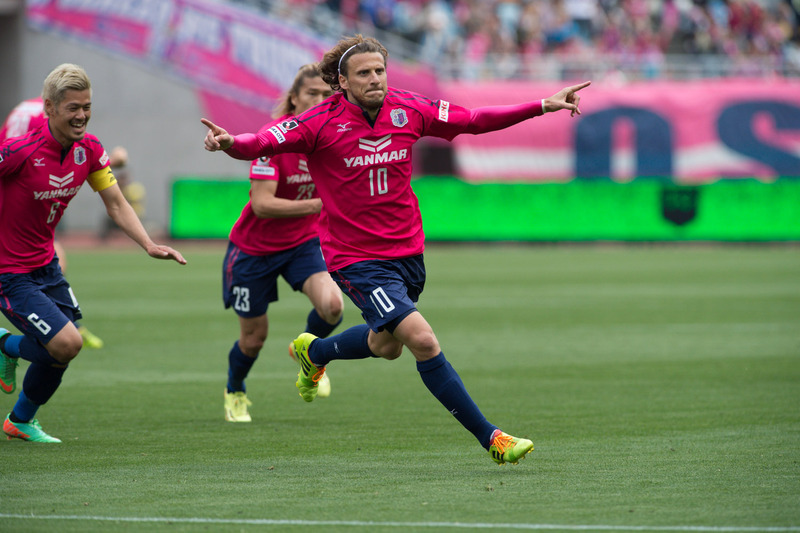 The club features the pink color in its home shirts and as an accent in most of its away kits as well. That and the fact that the club used the mountain design that is seen on Evian water bottles (if you just realized the club and the water come from the same town, you need to sharpen up!) on their shirts, really made the team look a bit like a packaged product. With Evian water's parent company Groupe Danone no longer sponsoring the club, the shirts will likely look much less like a water bottle, but will feature a pink color or accent in all three of its 2015-16 season shirts. 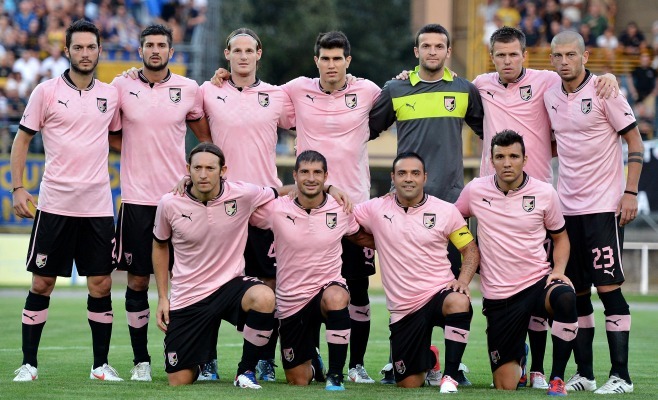 Without a doubt, Italian side Palermo are the most popular club associated with the color pink. 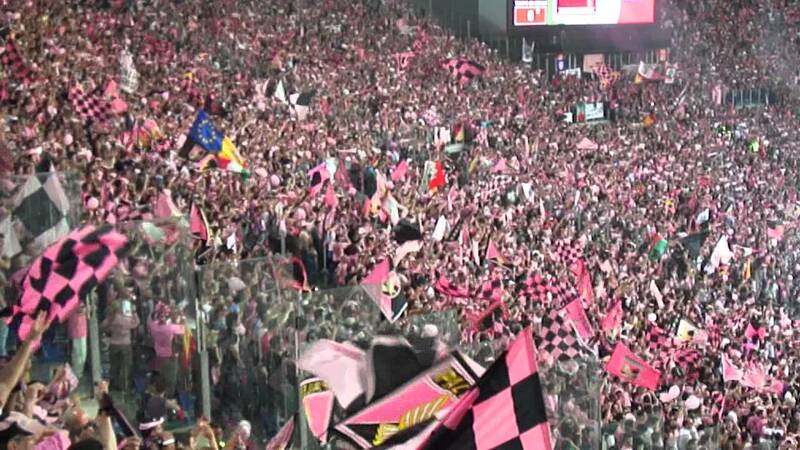 With a primary nickname as "Rosanero" (the Pink-Blacks), few could argue that the color is ingraned in the club's tradition and history. Pink has been used at the club since 1907, giving the color its only home where it was used for over a century in professional football. From 1936 to 1940 the club was ordered by the Mussolini regime to wear the colors of its municipality, which were yellow and red. Then in 1941 the club known as Palermo Foot-Ball Club merged with Juventina Palermo and sported a light blue color shirt for a year, but went back to the popular pink and black the following season, a combination they have embraced since.